Break away couplings are used for isolting lines in case of emergency. They work on shearing bolts technology. - Safety Breakaway devices when used with loading arms are designed to separate (break) and seal both halves of the pipe in the event of a “drive away, where a truck or rail car moves off with the loading arm still connected. The Safety Breakaway will separate at a predetermined load, both halves will seal the product to avoid significant damage to plant and the transport. Cryogenic Break-away Couplings are used to prevent pull-away accidents in the petroleum, chemical LPG industry all over the world. They are available as Industrial and Marine type. tubes. The connection is achieved by one hand operation. Disconnection is achieved by pulling back the male part. - Torsionally flexible providing protection against shock load, impact load and vibration. - Transmit full torque with dampened vibration and reduce peak loads. - installation at the dispenser. - all parts corrosion resistant steel & aluminium. 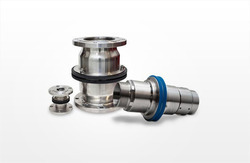 Eaton offers a line of Carter brand emergency breakaway couplings to meet the requirements of the commercial and military refueling industry.